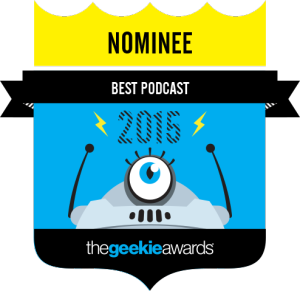 Vote for Hadron Gospel Hour for Best Podcast at The Geekie Awards! Your favorite sci-fi audio comedy/adventure show is up for a prestigious Geekie Award — for Best Podcast — and we need your help to go all the way! You can click here to vote — and you can do it once a day between now and August 31st! What’s a G eekie Award, anyway? The Geekie Awards is a yearly award ceremony that honors independent creators of science literature, webseries, comics, podcasts and fashion. From hundreds of entries, nominees are selected on the basis of high production values, content and genuine passion for the subject matter. The award ceremony is held in the Los Angeles area. Stan Lee and LeVar Burton have recently been guests of honor! It’s a BIG DEAL that we were nominated — and winning the award can really launch our show to the next level! We’re honored to be in competition with some amazing podcasts, and thrilled to be heading to Los Angeles in October for the awards ceremony. Why do The Geekie Awards matter? 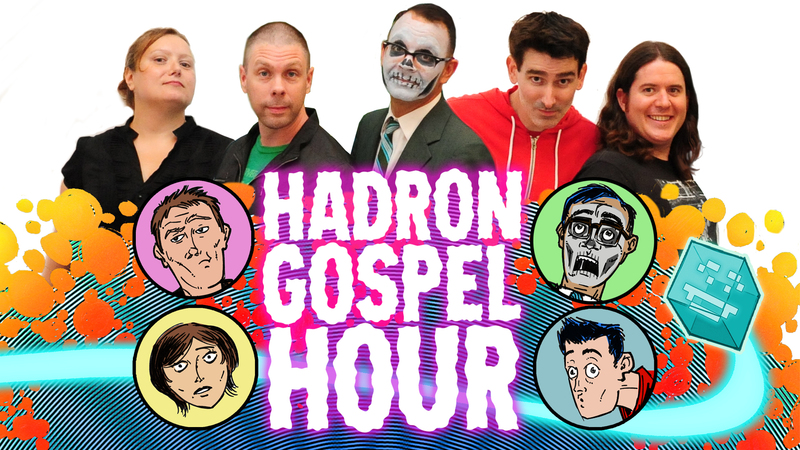 Winning a Geekie Award would guarantee Hadron Gospel Hour wider exposure. A larger audience would help us make this project more sustainable, which would mean more episodes for you to listen to! It’s a win-win! Our fate is in your hands now! Voting is open from now until August 31st, and you are allowed to vote once per day. If you want to help us win, think about setting a daily reminder on your phone or calendar. So g’head and click here to vote for Hadron Gospel Hour — remember, you can do it once a day between now and August 31st! *PRO TIP You can also download and include the photo above with your post! 1. Voting – Once every day until Oct. 15th. Set a reminder with this tune, for extra fun! 2. Share like crazy – Head to facebook, twitter, instagram, tumblr, your blog, etc., and tell everyone that you voted — and tell ’em they should vote for us (at http://vote2015.thegeekieawards.com/category/?cat=podcasts) too! One benefit of this is that it lets your friends know you’re into some super cool, quantifiably righteous, next level shih. 3. Let US know you voted — leave us a comment, tweet at us, just say hi! It’s really swell to hear from you, y’know! We hope you know how much we appreciate your help. We know that there’s a lot of noise out there competing for your earholes, and we’re always grateful that you choose HGH for your audio entertainment. In case you haven’t yet — don’t forget to click here to vote for Hadron Gospel Hour — you can do it once a day!